collective history, and to something beyond the physical world. The Transcriptions Series is created around the concepts of ancient books, ancient languages, and ancient prayers. These canvases have been influenced by the books and scrolls unearthed from antiquity. Sanskrit, Hebrew, Latin, and Ancient Phoenician are some of the languages incorporated within these mixed media paintings. My experience with the Transcriptions Series has given me the opportunity to create with canvas cloth. Now I am hooked and interested in continuing this exploration of my new favorite material. 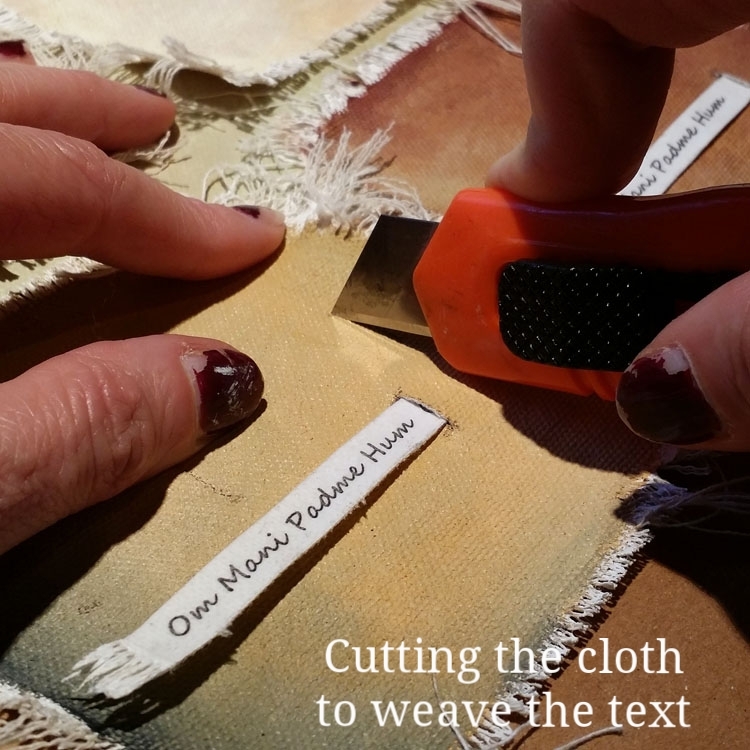 The current focus is on methods for using the cloth to showcase text. The use of text in paintings is another gem I am carrying forward from the Transcriptions. These small paintings were inspired by the closeup photos I had taken of the Transcriptions Series. They are painted onto layers of raw canvas cloth, then sewn together with added threads and text. The constructed piece is then stitched onto a slightly larger stretched and textured canvas to form the background for the piece. The studio right after it's been cleaned and organized. Sign up to receive art related news… I’ll share updates on artwork and the creative process, questions to ponder and links to explore, freebies and giveaways, upcoming shows and sales. Your privacy is respected. Your information will not be shared! Thank you! I appreciate your interest in the Shared Easel Newsletter. I’ll be in touch soon. The process of creating a piece of artwork is a journey requiring a number of steps before the finished product can be seen and appreciated. The artist gets to experience the joy of playing with the tools and materials to make their aesthetic vision come to life. I am so very grateful for the process and to be able to play with my materials to explore my creativity.